(Francisco Kjolseth | The Salt Lake Tribune) People cast their votes in the early hours shortly after the polls opened for the midterm elections on Tuesday, Nov. 6, 2018 at First Congregational Church in Salt Lake City. (Francisco Kjolseth | The Salt Lake Tribune) People cast their votes in the early hours shortly after the polls opened for the midterm elections on Tuesday, Nov. 6, 2018 at First Congregational Church in Salt Lake City. (Francisco Kjolseth | The Salt Lake Tribune) People cast their votes in the early hours shortly after the polls opened for the midterm elections on Tuesday, Nov. 5, 2018 at First Congregational Church in Salt Lake City. (Francisco Kjolseth | The Salt Lake Tribune) People cast their votes in the early hours shortly after the polls opened for the midterm elections on Tuesday, Nov. 5, 2018 at First Congregational Church in Salt Lake City. (Francisco Kjolseth | The Salt Lake Tribune) People cast their votes in the early hours for the midterm elections on Tuesday, Nov. 6, 2018 at the Columbus Center in Salt Lake City. (Francisco Kjolseth | The Salt Lake Tribune) People cast their votes in the early hours for the midterm elections on Tuesday, Nov. 6, 2018 at the Columbus Center in Salt Lake City. (Francisco Kjolseth | The Salt Lake Tribune) People cast their votes in the morning for the midterm elections on Tuesday, Nov. 6, 2018 at the Riverton Senior Center. (Francisco Kjolseth | The Salt Lake Tribune) People cast their votes in the morning for the midterm elections on Tuesday, Nov. 6, 2018 at the Riverton Senior Center. (Francisco Kjolseth | The Salt Lake Tribune) People cast their votes in the morning for the midterm elections on Tuesday, Nov. 6, 2018 at the Riverton Senior Center. (Francisco Kjolseth | The Salt Lake Tribune) People cast their votes in the morning for the midterm elections on Tuesday, Nov. 6, 2018 at the Riverton Senior Center. (Francisco Kjolseth | The Salt Lake Tribune) Salt Lake County Clerk Sherrie Swensen checks in with staff as people line up to cast their votes for the midterm elections on Tuesday, Nov. 6, 2018 at the Salt Lake County offices. (Francisco Kjolseth | The Salt Lake Tribune) People line up to vote for the midterm elections on Tuesday, Nov. 6, 2018 at the Salt Lake County offices. (Francisco Kjolseth | The Salt Lake Tribune) Elections worker Carson Adams runs ballots through a high speed tabulation machine during the midterm elections on Tuesday, Nov. 6, 2018 at the Salt Lake County offices. (Francisco Kjolseth | The Salt Lake Tribune) Elections worker Carson Adams runs ballots through a high speed tabulation machine before locking them during the midterm elections on Tuesday, Nov. 6, 2018 at the Salt Lake County offices. (Francisco Kjolseth | The Salt Lake Tribune) People line up to vote for the midterm elections on Tuesday, Nov. 6, 2018 at the Salt Lake County offices. (Francisco Kjolseth | The Salt Lake Tribune) Elections workers lock boxes of ballots after running them through a high speed tabulation machine during the midterm elections on Tuesday, Nov. 6, 2018 at the Salt Lake County offices. Editor’s Note: Check back throughout the day for the latest news, updates and analysis of Utah’s 2018 midterm election from The Salt Lake Tribune’s award-winning political reporting team. There are third-world nations that do elections better than Utah County. Three hours after polls closed Tuesday, Provo residents were still waiting in line to cast their ballots. Three hours, standing in line to vote in races that, frankly, probably weren’t going to be very close anyway. Gotta give them credit for their commitment. But they weren’t alone. Long lines were the norm in Utah County. There were reportedly three hour lines in Orem this morning, three hour lines in Santaquin this evening, two hour lines in Lehi all day. People were in line two hours after polls closed in Saratoga Springs. Maybe all these folks were really excited about the opportunity to vote for a new county clerk. Three hour wait in Saratoga Springs. Why do we not have more machines available. I’ve come three times today hoping the line would be shorter. It’s ridiculous but also makes me feel pride that so many people have turned out to show they want their voices heard. So you want results in the 4th District race between Republican Rep. Mia Love and Democratic Salt Lake County Mayor Ben McAdams. I get it. But you probably won’t get them tonight. For one thing, it’s looking like this is going to be an EXTREMELY close race. On top of that, there will be mail-in ballots still trickling in over the next few days. But maybe the biggest question mark is going to be the huge number of provisional ballots that are being cast. That’s a product of two factors. First, there are the normal provisional ballots that get cast every election, thanks to someone moving and not updating their address or the like. The second is turning out to be a much larger factor, and one that we haven’t had to deal with before — same-day voter registrations. For the first time this year, voters could register at their polling place and the good news (because I am a Polyanna) is that the response has been staggering. The bad news is that each of those voters registering at their polling place had to cast provisional ballots and each of the ballots and registration forms has to be reviewed on a case-by-case basis to determine if they can be counted or not. 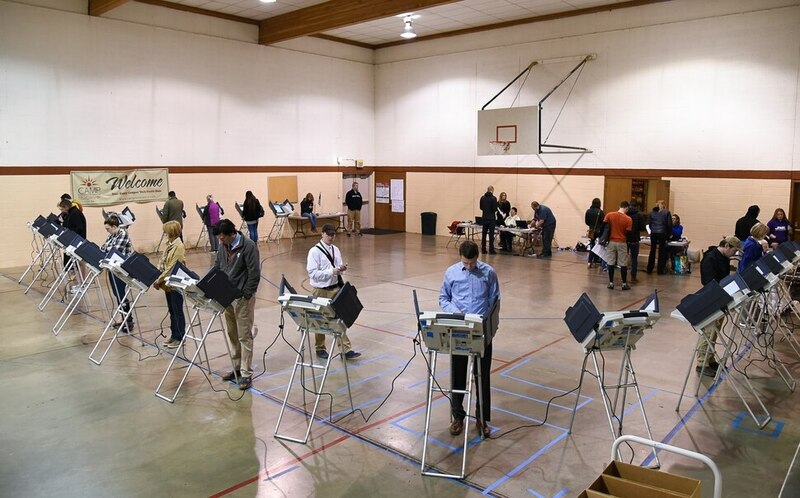 Salt Lake County Clerk Sherrie Swensen said Tuesday evening that in some polling locations as many as half of the votes that were cast on Tuesday were provisional ballots cast by new voters. It will likely take up to two weeks to verify those registration forms and decide which ballots will be counted. That means we may not have reliable vote totals for two more weeks. And in tight races — not just the 4th District, but in a few state legislative races, and possibly one or two of the propositions — we may not know the outcome for quite a while. Consider it overtime for people who like politics more than sports. 5:45 p.m. — Fraud-sniffing Dogs? Blake Spalding is no shrinking violet. As co-owner of Hells Backbone Grill in Boulder, she has been outspoken in her political views, most notably her advocacy for protecting the Grand Staircase-Escalante National Monument. So she’s understandably a little suspicious as to why sheriff’s deputies showed up with a dog at the big house where staff at the grill live and started asking people to prove they were legally registered to vote. Spalding said the deputies were asking her staff how long they had lived in the district and telling them that they had to live there for six months in order to legally register (in fact, the law says 30 days). And they asked her employees if Spalding had forced them to register to vote. Spalding said the deputies confiscated several ballots that had been sitting in a common area at the house. KUTV’s Chris Jones reported that he spoke to Garfield County Sheriff James Perkins who sent the deputies because there were between a dozen and 20 people registered at the same address. The address belongs to a former polygamist home with nine bedrooms where her employees live, Spalding said. There are also trailers on the property. And what’s up with the dog? Is this dog somehow specially trained to sniff out voter fraud? State Sen. Jim Dabakis said he plans to ask the lieutenant governor and attorney general’s offices to investigate. A man made instant friends outside a polling place at the University of Utah Tuesday. The unidentified man brought an extra-large pizza to give to folks lining up outside the Marriott Library waiting to vote. The moment was captured on the U.’s Twitter feed. 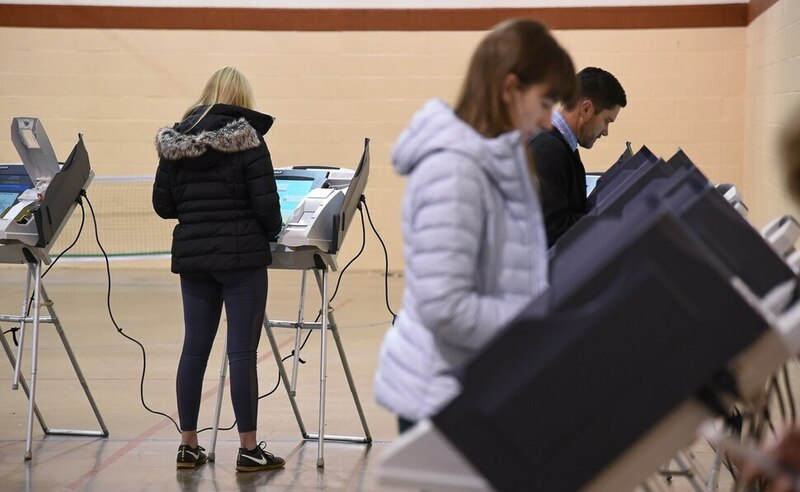 This year is to be the first in decades that college students around the state haven’t fanned out to polling places to question voters for the Utah Colleges Exit Poll. The poll was a valuable trove of, not just election night data, but insights into why people voted the way they did. And, while we never called races based on the exit poll numbers, we did look to them to reinforce our decisions to call various races. Fortunately, Brigham Young University professor Kelly Patterson, who was part of the braintrust behind the exit polling, is doing his own thing. For a little over a week, Patterson has been contacting voters via postcards and email, asking them to take an online survey that should tell us a lot about the voting trends in the state. So far, Patterson says he has an estimated 2,500 responses from around the state. The reason for the change in methodology — contacting voters at home instead of leaving polling places — is obvious when you think about it. 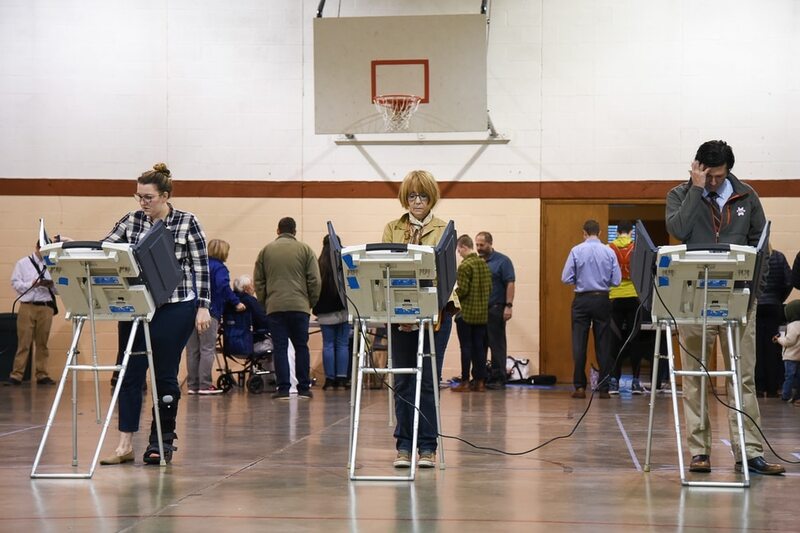 “[A polling place survey] doesn’t work now because so many people already voted, and those people who vote on Election Day are systematically different than the people who vote by mail and in the early voting period,” Patterson said. Patterson is doing the polling in conjunction with Y2 Analytics, the firm that conducts polling for Rep. Mia Love, but he assures his work is completely independent of the Love campaign or any other campaign or party. Patterson won’t be releasing any results tonight, but he does plan to release the data, hopefully soon, in an effort to fill in some of the gaps in what we know about the trends driving the 2018 midterms. Some Pennsylvania activists say they are inspired by the Utah drive to end gerrymandering through Proposition 4 — and wish they had the power there to allow citizens to put issue referendums on the ballot. “The efforts of people in Utah who are working to strengthen our representative democracy have been noticed and will inspire our efforts to ask our legislators to restore the power of our vote,” Carol Kuniholm, director of Fair Districts PA, emailed the Tribune. She said her group is pushing to end “the egregious gerrymandering that has choked democracy in our state for decades,” and has collected signatures from 40,000 Pennsylvanias seeking to create an independent redistricting commission there. But she said legislators have thwarted a needed constitutional amendment. In Utah, Better Boundaries gathered more than 150,000 verified signatures from voters to put Prop 4 on the ballot. Utah Republicans have many options for election night parties — perhaps too many. Whereas high-profile Democratic candidates like Ben McAdams and Jenny Wilson plan to join their state party’s festivities at the Radisson hotel in downtown Salt Lake City, Republican candidates have splintered away from their party’s party at the Vivint Smart Home Arena. Senate candidate Mitt Romney is hosting an event at his campaign headquarters in Orem, and Rep. Mia Love will watch the results at the Hilton Garden Inn in Lehi. Even Nathan Evershed, the GOP candidate for Salt Lake County District Attorney, elected to host his own event at the Courtyard by Marriott hotel in downtown Salt Lake City. But at least one big name is expected to join the Republicans at The Viv — Sen. Orrin Hatch, who is retiring from the Senate after seven terms and 42 years in office. How big has voter turnout been already this year? Well, according to the most recent (and last) early voting report from the state elections office, more than 700,000 Utahns have already voted. That’s already easily eclipsed the nearly 578,000 who voted in the last midterm election in 2014. And a lot more are expected to vote Tuesday. The Associated Press is basing its election night models on an estimate that 900,000 Utahns could vote before it’s all over, a 56 percent increase from 2014. Let’s drill down into those numbers a little bit. 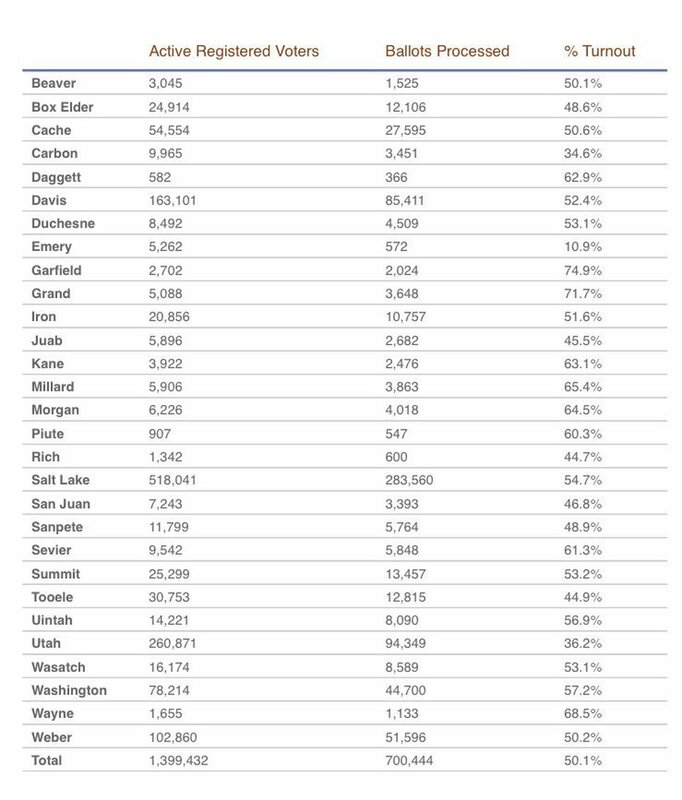 These are the latest (and final) report on the numbers of early voters by county across Utah. The 700,444 easily eclipses the total of just under 578,000 voters who cast ballots in the 2014 midterm election. First, and most obvious, look at the Salt Lake County turnout! Already, 283,560 people have voted, up from a total of 229,379 four years ago. We don’t have a breakdown by congressional district, but 85 percent of the voters in the 4th District are in Salt Lake County, so a big turnout there likely favors Democrat Ben McAdams over Republican Rep. Mia Love. There’s also some bad news for Love in the really low turnout in the GOP stronghold of Utah County. Yes, it has eclipsed the 2014 vote total by about 6,000, but does have the lowest rate of early voting in the state, and this is a place where Love needs to rack up a lot of votes to help offset the Salt Lake County numbers. This could change, of course, and there are reports of long lines at polling locations in Utah County (see below). The really high turnout (no pun intended) could also bode well for Proposition 2, the medical marijuana ballot initiative, and potentially other initiatives as well. Earlier polling showed that young people were much more inclined to support Prop. 2. According to voter modeling by the political data outfit Target Smart, about 1 in 5 voters so far is an infrequent voter or first-time voter. And about 10 percent are below the age of 30. That doesn’t sound like much, but is a substantial increase from past elections. And, hey, let’s give it up for Garfield County. Turnout there is already at 75 percent. Fewer than 600 registered voters in the entire county haven’t cast ballots yet. That’s amazing. Utah County has had its share of problems running smooth elections and 2018 appears to be off to a rocky start. By 8 a.m. this morning, there was already a two-hour line at the Orem Scout Office polling place, pollworkers told voter Richard Jaussi, who lucky for him, was just dropping off his mail-in ballot and was able to skip the line. Up in Eagle Mountain, meantime, voting machines malfunctioned, leaving voters trying to cast their ballots before work with just one working machine and an hour-long wait. There are reports of long lines at other polling places in the county, as well. Vote-by-mail was supposed to alleviate some of these problems, but for whatever reason, barely a third of registered voters in Utah County mailed in their ballots before Election Day. So voters who are planning to vote in person should anticipate spending extra time in line, or they can fill in their mail-in ballot and deliver it straight to a ballot box. This will be long-time Utah County Clerk Bryan Thompson’s last election. He lost the Republican nomination to Amelia Powers, who does not have a Democratic opponent but is facing Independent American candidate Jason Christensen on Tuesday’s ballot.